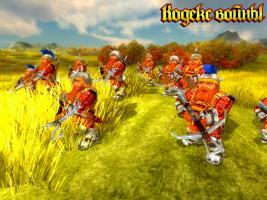 The main purpose of Dwarven Crossbowmen is to destroy armored objects from a distance. They are able to give support to neighboring friendly squads, if they are under enemy attack. They are also able to flight against flying units. They can act alone, being well protected by armor from melee attacks. Especially efficient in hilly terrain. Crossbows designed by Dwarf blacksmiths pierce heavy armor right through. Although some jokes about low accuracy of Dwarves are heard a shower of steel bolts will make any enemy to take these crossbowmen seriously. If someone makes dwarven crossbowmen to engage in a melee he usually gets frustrated with solid armor and crushing damage of blows these dwarven shooters strike.